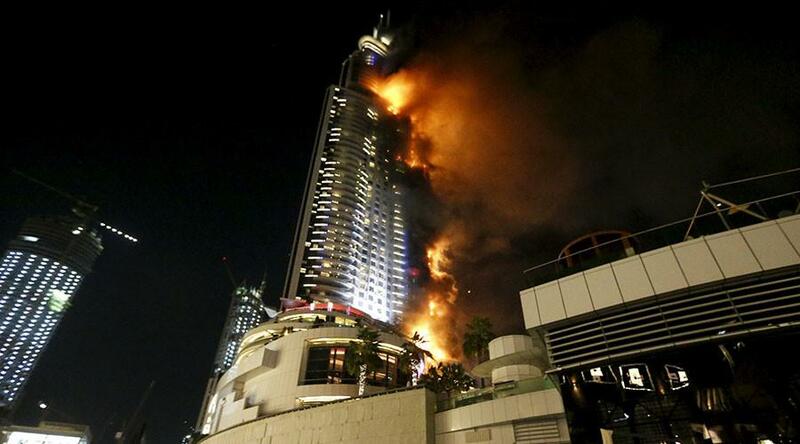 Within minutes, the revelry of New Year's Eve in Dubai turned to horror as those gathered for fireworks downtown watched flames race up the side of one of the glistening city's most prominent luxury hotels. DUBAI, United Arab Emirates (AP) _ Within minutes, the revelry of New Year's Eve in Dubai turned to horror as those gathered for fireworks downtown watched flames race up the side of one of the glistening city's most prominent luxury hotels. But the rules did not call for retrofitting buildings with flammable cladding already installed _ nor is there any clear idea of how many of these buildings stand in Dubai or the UAE's other six emirates. “There's an exposure because there's a lot of them and unfortunately they don't come with an `X' on the building to know which ones they are,” said Sami Sayegh, global property executive in the Middle East and North Africa for insurance giant American International Group, Inc. However, Ibrahim insisted that the type of cladding that was involved in previous tower fires appears to have been used on only a small number of all buildings in the emirate _ a figure he suggested could be as little as 5 percent. But he acknowledged that officials don't know how many buildings are at risk. “Without (doing) the survey or something, we can't say the number exactly,” he said. The problem is not Dubai's alone _ cladding fires have struck elsewhere in the world.